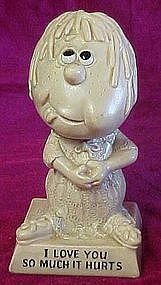 Berries sillisculpt sentiment figurine. "I love you so much it hurts". Measures 6 1/2" tall. Worn felt bottom. No damages to casting. Dated 1970.